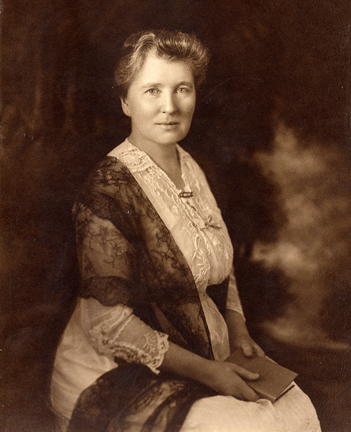 The Spence School was founded in 1892 by Clara B. Spence, who was its head for 31 years. The school's motto is "non scholae sed vitae discimus" (Latin for "Not for school, but for life we learn"). The first building was located on New York City's West 48th Street. The school once had a boarding option, but all current girls are day students. Clara B. Spence described her school as: "A place not of mechanical instruction, but a school of character where the common requisites for all have been human feeling, a sense of humor and the spirit of intellectual and moral adventure." Born in Albany, New York, in 1859, Clara Spence was a member of the new middle class. She graduated from Boston University's School of Oratory in 1879, after which she attended London University, where she honed her acting skills. She moved to New York City originally aspiring to be an actress but, upon the death of her mother in 1883, she shifted her talents to teaching at private schools for girls. In 1892 she founded her own school in a brownstone at 6 West Forty-eighth Street. It was in this school that Clara Spence began a nursery for abandoned babies. Clara Spence dedicated herself to the cause of abandoned infants and introduced her students to adoption as a new and fulfilling form of social work. This meeting was remembered with great vividness by Miss Baker as Miss Spence came forth to meet her carrying a large armful of American Beauty roses. Her penetrating and sparkling blue eyes and a purposeful walk dramatically impressed Miss Baker, and so these two remarkable ladies met. Together, Clara and Charlotte ran the Spence School, living with their children in an apartment on the fifth floor of the school’s building at 26 West 55th starting in 1900. Clara spent summers at The Willows in Bar Harbor, Maine, the home that Charlotte built in 1913. Clara believed in exposing her students to the major artists, writers, leaders and thinkers of the era, especially the women. She hired Isadora Duncan, a bisexual and a communist, to teach interpretive dance to her students, had her friend Edith Wharton lecture and invited Helen Keller to talk through her interpreter, Anne Sullivan. Ruth Draper, who attended Spence for a year, was Clara’s good friend, and she gave her pioneering monologues at the school. When Booker T. Washington came to New York City to raise money for the Tuskegee Institute, which he founded in 1881 in Tuskegee, Alabama, to educate black teachers, he spoke at his friend Clara’s school and stuck around to dine with the girls. The young writer Aldous Huxley and his evolutionary biologist brother Julius came to dinner when they were visiting New York City.